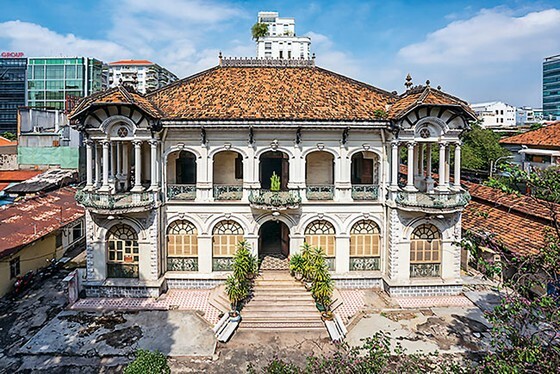 The front of the mansion faces Vo Van Tan Street with Ba Huyen Thanh Quan street on its side and Nguyen Thi Dieu street behind in District 3. The building has three entrances comprising two main gates in Vo Van Tan Street and one side gate in Ba Huyen Thanh Quan Street, two storeys measuring 1,780 square meters designed in North – South direction. The main part of the house has an area of 990 square meters, including 16 rooms connected by central staircase. The architecture of the mansion shows the presence of Art Deco and Art Nouveau styles, creating a unique architecture feature of Saigon in the past thanks to modern European techniques. Interior decoration shows characteristics of Vietnamese culture. Built in the 1920s, the mansion exists for nearly a century and still stands out from surrounding buildings. And for Minerva, now the key issue is the correctness and scientificity in conservation works. Therefore, all of the investors, supervision consultants, contractors and experts must be scientific and serious in their works. Because if there was only one mistake, we would no longer have the opportunity to repair. Experts in the conservation group said that in term of construction method, the mansion was built with the most advanced techniques in the early 20th century with floor frames and steel trusses similar to the structure of the Eiffel Tower, concrete blocks and stone steps. Materials were mostly imported from France including roof tiles, ceramic tiles and decorative mirror tiles. Notably, the villa has two fully equipped bathrooms in the main part of the house, a rare style at that time. Because normally, the kitchen and bathroom were arranged independently out from the main part of the house, on the house campus, during the first half of the 20th century. The original owner was identified as Mr. Nguyen Van Nhieu. In the period of 1946-1955, the palace was used by the French army as the headquarters. Aftewards, it was sold to a rich man, who named it Phuong Nam villa. From 1960-1970, a suite of rooms was built along Ba Huyen Thanh Quan Street to be used for a foreign language school. Later, this villa belonged to two people including Dang Kim Chi born in 1938 and Nguyen Kim Sa Dang born in 1934. In 2015, they sold it to Minerva Joint Stock Company at the price of US$35 million. The old mansion before restoration. The site manager is an English woman from Stonewest Limited. French architect Nicolas Viste, leader of the restoration team, was also present at the project, discussing with the experts. 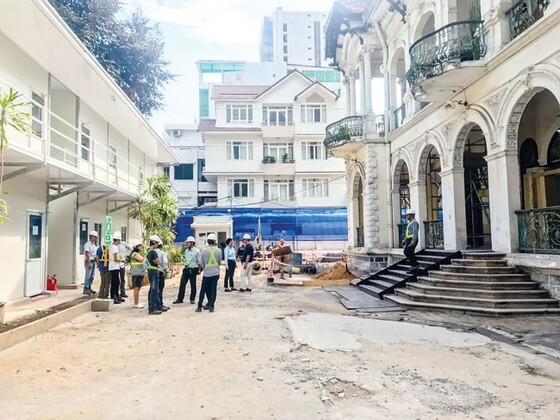 The reporters found that suite of rooms along Ba Huyen Thanh Quan Street have been dismantled. Inside the main part of the villa, the central staircase and floor were carefully covered for repair work. On average, there are about 50 experts and engineers of contractors working in the old mansion every day. The result of building inspection shows that the foundation, the truss, the column ... are very good. However, many items and details in balcony, roofs, walls, bricks, doors ... are badly damaged and must be restored. 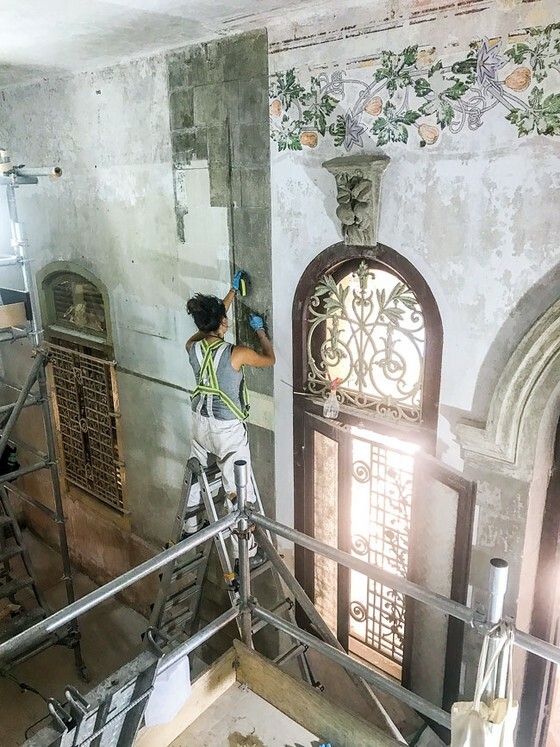 Due to the complexity of the mansion’s restoration, Minerva Company has invited experts from Vietnam’s Hue city and from Germany, Italy and France for the past three years to fully and comprehensively study and find the most feasible solution before conducting restoration. In addition, Minerva has also promoted cooperation with the Palazzo Spinelli Academy, museums, Ho Chi Minh City University of Technology (HUTECH) and Van Lang Univeristy for the purpose of training and developing human resources in conservation and restoration. Firstly, the restoration work will focus on painting restoration bid packages. In most of the rooms, there are Asia style murals and ceiling paintings such as the ceiling painting of The Twelve Fairies, fruits and flowers... These paintings are hidden deep inside in the paint layers. Therefore, experts will perform the process of peeling and cleaning each layer meticulously to restore the paintings. Ms. Maria Constancio, Spinelli Academy's expert, peels off the paint on the wall to restore the patterns in the old mansion. One Minerva representative said: “Through this project, JSC Minerva wishes to accompany with the city government in the urban heritage preservation. And one of our concerns, besides the support of the government, is how to attract more young people in heritage preservation works. We should not depend entirely on foreign experts. So, recently, we organized a heritage seminar and brought this information to students. We have received positive feedbacks, especially from the Architecture and Fine art departments in many universities. "This opens up a new approach. and Minerva want to connect international cooperation on science and training human resources in heritage preservation for interested parties. Finally, through this conservation project, we wish to spread the love for urban heritage, so that everyone preserve and promote the good values that our ancestors left for Saigon - Ho Chi Minh City. If we do this well, the next generations will have something to preserve and be proud of." When asked how to exploit effectively and harmoniously the interests of relevant parties when the project is completed, the Minerva representative said that this was hard to find out. According to the Minerva representative, even developed countries had similar difficulties when referring to the concept of heritage economy. But Minerva is very confident in the heritage economic model, which has been applied in developed countries.